The golden eagle is not on the federal list of endangered species, but some states list it as endangered, some list it as a candidate, and some state and federal agencies are greatly concerned about golden eagle populations. 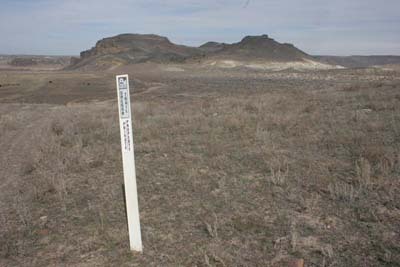 Here in the Snake River Birds of Prey Conservation Area, the golden eagle population has declined by 30% since 1970. Retired bird biologist (and endurance rider) Karen S helps monitor golden eagle nests in this area, and I've been out with her to a couple of nests the last couple of years, by vehicle, on foot, and on horseback. We drove out Tuesday to check on a couple of nests. First, the new golden eagles on Bates Creek. 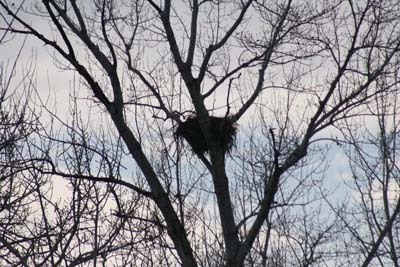 They are not nesting yet, though I see them almost every day that I drive down the road past the nest. At least one of them likes to sit on his pointed cone on the distant rim, from where he has his eagle eye view of the nest. Sometimes I'll see them both soaring over the creek, and occasionally one will be sitting in a tree near the cottonwood tree with the big nest in it. One day last week I saw one of them standing on the nest, and a neighbor saw one of them fly to the nest with sticks. 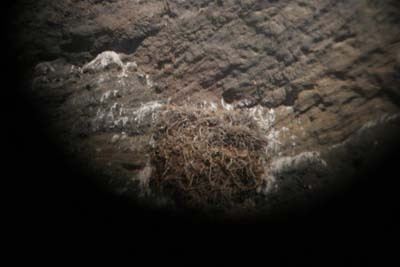 They are still giving indications that they will use that nest, but no egg-laying or sitting on the nest so far. I worry about the proximity of the nest to the road, and the traffic on the road. Mind you, it's a dirt road, and the traffic might be 1 car twice a day, or at the most 4 cars twice a day, but that still might be too much for them. Anytime I slow down when one or both are in or near the nest tree, they fly away. 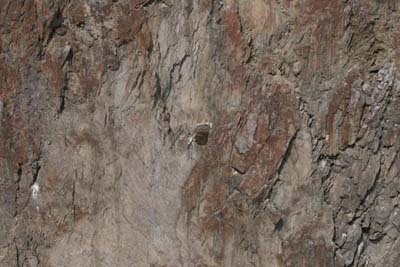 Perhaps they are waiting for the leaves to come out on the cottonwood tree to shield them, in which case humans won't even know they are there, and if we do know, we won't be able to see them. Or maybe they won't lay eggs at all. So far, all we really know is that they are still interested in that particular tree nest on the creek. We'll know soon one way or the other. 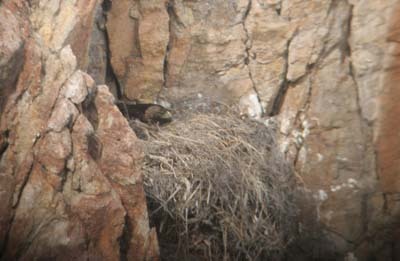 I'd only glanced at on my first visit, because I'd been concentrating on the largest of the 6 nests on that cliff, the one that looked like it was going to be used. In fact the eagle I'd seen fly off had probably been the mate perching nearby, and the other eagle had likely been on the nest and I'd just not seen her (or him - both male and female eagles will incubate the eggs). Today she seemed not the least concerned with our presence, hardly deigning to watch us. She'd picked ultimately the best positioned nest; this one got morning sun, but not the blazing afternoon sun. 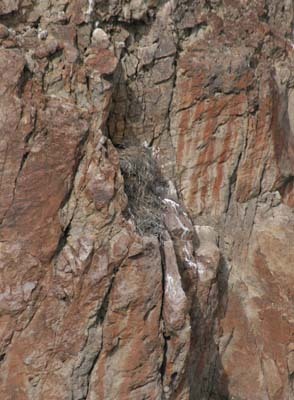 Heat is a main killer of young eagles in cliff nests; that won't happen here with this nest. It's a fair sized nest, built up at least 3 feet over the years, partially tucked in a crevice, and you can see the fresh (brown) sticks and grasses on it. Karen was unable to check this site last year, but the previous year, a pair had laid eggs and incubated them, but ultimately failed. 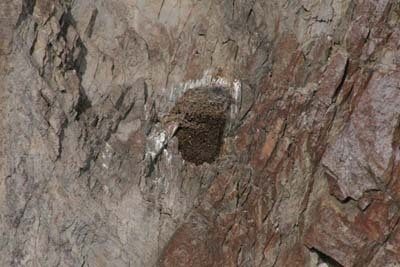 The three nests on this cliff face are directly in the sun all day - a tough obstacle in a hot summer. Karen put her scope on the most likely nest - one which had whitewash, and fresh 'greens' for 'decoration' (or in this case 'browns' - since there isn't much green in the desert right now). It's a sizable nest too, about 3-4' tall. 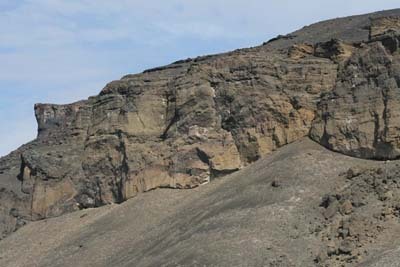 We soon spotted one eagle soaring over the butte... and after a while saw the second one soaring with it. Likely the nest was unoccupied so far. There's still time for them to lay eggs. It wasn't a bad golden eagle day: 5 golden eagles, 3 territories, 10 (or so) nests. But only one pair nesting... so far. Merri, thank you very much for sharing your experiences and the wildlife with us. I bought a horse from Carol and was fascinated with the country there. Seeing all your photos makes me wish I was there to see the eagles. 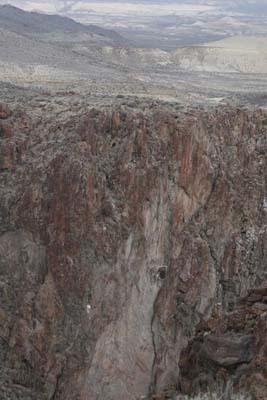 My goal is to come and ride Owyhee Canyonlands in September and to meet you.